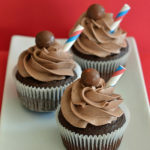 Delicious and moist chocolate malt cupcakes with a fluffy chocolate malt frosting you can’t resist! 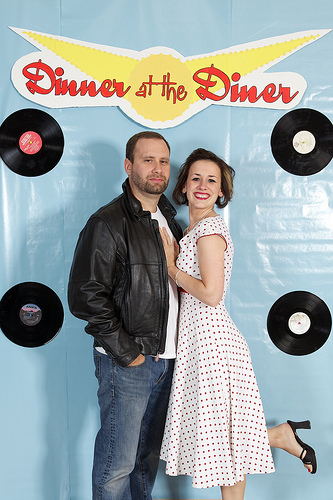 The Friday before Valentine’s Day our church held a couples’ event with 50’s flair, called Dinner at the Diner. Everyone showed up in their 50’s outfits, some which were quite amazing. Friends shared their candy cigarettes with us and there were bubble gum blowing games along with who could hula hoop the longest. To bring out the music of the decade, a jukebox played hoppin’ oldies music all night long. Although the meal was catered by a local deli, Ben was in charge of planning this event, so I really wanted to serve up something of my own. My contribution to the dinner were these chocolate malts in cupcake form! Who doesn’t think of chocolate malts when eating at a diner? But, it was impossible for us to keep that many malts from melting so, naturally, cupcakes were the solution. The cake part of these were amazing, but the frosting really stole the show. I honestly could not keep my hands (tongue) off it! (No worries, I kept things sanitary people!) 🙂 It was chocolaty, malty, fluffy and just a dream to pipe. Ben even declared it the best frosting ever. These cupcakes were a hit and really dressed up the dessert table with their festive paper straws. I would love to have a reason to make these again — and soon! Delicious and moist chocolate malt cupcakes with a fluffy chocolate malt frosting you can't resist! Preheat the oven to 350 degrees F. Line standard cupcake pans with paper liners. In a mixer bowl, use the whisk attachment to blend the milk and malted milk powder. Mix until the powder is dissolved. In a separate medium bowl, whisk together the flour, cocoa, sugars, baking soda and salt. Slowly add the flour mixture and the oil to the milk mixture, blending on medium-high speed until incorporated. Add eggs one at a time, scraping down the sides of the bowl as you go. Stir in the sour cream and vanilla until just combined. Whip the butter and shortening together in a large mixer bowl on high speed for several minutes until very light and fluffy. (Be patient!) Stir in the malted milk powder and cocoa. Whip on medium-high speed for 1 minute. Slowly add the powdered sugar about 1/2 cup at a time. Mix until the frosting becomes thick and a stiffer consistency for piping. 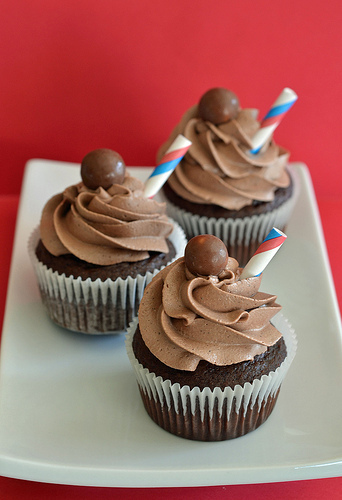 Pipe large swirls of frosting on top of cupcakes and top with chocolate covered malt balls and straws, if desired. Peace n prosperity Nikki, I come to your website often but I am usually a lurker. I decided I’d finally post a comment for post saying how much I love visiting your blog as I think your writing is both exciting and helpful. Keep your blog up-to-date and you have a visitor for life, glad to meet you,thanks. 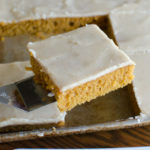 I made a similar recipe for these a few weeks ago and they were so good! Who knew chocolate malt flavor would make such great tasting cupcakes? Your pic with the straws are too cute! 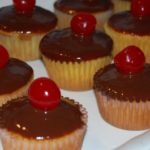 we’re totally on the same wavelength today, Nikki – I posted malted milk chocolate milkshakes…though I think I would take one of these cupcakes over a milkshake any day! Wow, the best frosting ever. That has me intrigued. Love the photo btw! These look and sound super yummy – definitely trying them. Also, you look like June Cleaver. So cute! These really are a perfect dessert with that theme. They look fantastic! These look scrumptious! I’ve been craving doing something with malt lately, and now you have me wanting to do a whole 50s theme! I’m so glad you enjoyed these cupcakes as much as I did! 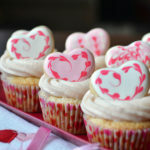 They’re one of my absolute favorite cupcakes at the moment, I don’t think I could ever tire of that delicious frosting! What a super fun theme for a party! You look so cute in your diner outfits! Malts make me think both of diners and those old school ice cream parlors. Oh those were the days. What a gorgeous cupcake! I have to say that those cupcakes were amazing. My wife and I were talking about them all week after the dinner at church. I found that the frosting was not only the perfect texture, but it also has just the right flavor to go with the rest of the dessert. I’m sure we will make these in our home sometime soon. Okay, that’s it, I have to make these right now! I love malt flavor! I even have some of that malted milk powder in my pantry, if it isn’t expired yet, I think I will give these a try in the morning. Is that you in the picture? You are so so so skinny! Such a cute photo! Great presentation! Wow, you did a good job shooting this! It has such great colors. I’m from Sweden and I just moved back here from living abroad the past years, and we don’t really have cupcakes (if you don’t make them yourselves of course). I miss them! I LOVE malt powder…I bet this frosting was insane. I will definitely be trying it!! Your pictures are too cute!! These look awesome. My husband and I share a love of chocolate malts….I will be trying these soon! Beautiful cupcakes! Looks super delicious! congrats on top9! I love this idea! Definitely must make it for my boyfriend and his coworkers soon :). The malt cupcakes are ADORABLE!!! What pastry tip did you use for the piping? I must try this recipe, Nikki! You made me drool.